The UIC Global Blood & Marrow Transplant (BMT) Training Program funds travel and stay for physicians from around the world who want to improve or develop transplant programs in their own countries. Now, with a donation from the Ukrainian Medical Association of North America (UMANA) Foundation, the program will expand its work in Ukraine, which includes training Ukrainian physicians and establishing BMT programs is Kyiv, the capital of Ukraine, and Lviv, the country’s largest western city. Each year, approximately 2,000 people in the country need a transplant, but many cannot access this kind of care because most Ukrainian hospitals lack the infrastructure and training to provide the service. 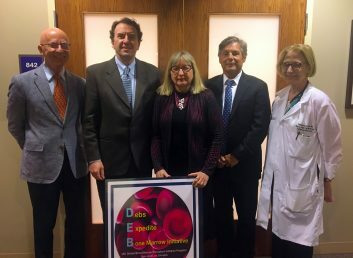 Maria Hrycelak and Dr. George Hrycelak, executive director of UMANA, met with Rondelli and UIC’s Dr. Daniel Hryhorczuk and Dr. Patricia Finn to deliver the $10,000 check. The funds were raised by the UMANA Foundation during its gala dinner. “This generous support from the Ukrainian Medical Association of North America’s foundation dovetails nicely with our work with the Ukrainian national cancer institute,” Rondelli said. The combined efforts of UI Health, the department of medicine at the UIC College of Medicine, and the UIC Center for Global Health help make the Global BMT Training Program possible.